I have to admit, I am kind of a history buff. For example, I was just reading that a new North American Viking site was discovered from – of all places – space. Pretty amazing! From a historical perspective, as the Vikings moved southward, they were looking for better places to grow crops and create settlements. However, the further south they went, the more indigenous populations they encountered. The Vikings had many competitive advantages against the first North Americans, including ship building, metal weapons and even superior battle tactics. But as they faced larger adversaries, the Viking penetration of North America was blunted. It was only later when there was an overwhelming competitive advantage, including all forms of firearms, that Europeans gained a real foothold in the New World. If we look at enterprises today, overwhelming competitive advantage is about to displace existing marketplace competitors. Many call it the Uber effect. Most enterprises survived Web 1.0 by simply putting a Band-Aid on their existing systems and creating a Web server to the outside world. This response was much like the response of New World peoples. Today, however, we are seeing startup companies competing in ways where simply adopting new tactics quickly will not work. Companies with data at their core are going to win unless existing market players fix their data – in particular, their company data – and enable predictive models to guide, for example, how they interact with customers. Clearly, existing companies are playing with their back against startups with data chops. Most find themselves saddled with historical legacy investments that cannot keep up with the speed of today’s business. The next thing to counter startups is for companies to put data at their core. For many, this starts by committing to fix key elements of their existing data. How can you compete on customer experience or provide predictive offers or dynamic adjust order rates unless you have a complete view of your customers and their relationship with you? Expenditure needs to be freed up from running the business IT. It costs real money to build predictive models to improve your supply chain or provide IoT-type solutions. This tends to involve upgrading and eliminating applications that are no longer relevant. Through all of the IT value chains, huge costs are contained in just keeping the lights on by maintaining applications, server capacity, storage capacity and network connectivity. Taking these costs out can allow existing market players to start to invest. IT needs to get closer to the business. If they don’t have a business technology vision, then IT needs to get closer to business change agents. IT needs to enable them and it needs to invest increasingly in level 2 investments—new data sources, big data lakes and self-service data evaluation capabilities. IT needs to be an enabler of predictive analytics models to provide offers to customers that matter and, where appropriate, value-added software and applications. As part of this, IT leadership needs to view themselves as venture capitalists. They need to look for the change-the-business investments with the highest business payoffs. Linear work needs to be done but should not be the driver of IT investment levels. IT, of course, can go further by asking, “Why do we have a datacenter? Can others do this function better? What do we do that leads to business competitive advantage or detracts from it?” This last question is the most important. IT needs to do the things that drive business advantage. By doing this, the business can gain the competitive advantages needed to go against a disruptor or a startup. 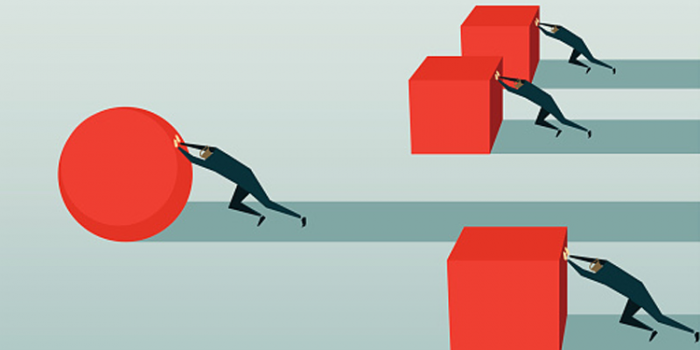 Put simply, don’t let startups gain an overwhelming competitive advantage. This means data and analytics need to be made a priority before an Uber enters your business and attempts to rewrite the rules of existing business competition. The time is now to get your data and analytics act together. NASDAQ says winners aren’t satisfied with good data. How to move from good to great data?